The night began with spot light addict and United States Champion John Cena. In an attempt to make the historical evening all about him, Cena once again issued the open challenge to anyone who might with to try for his ill gotten championship. However it seemed as if John knew he was the face I really wished I could not see as he spared the WWE Universe another of his snore inducing speeches and just got right on to business. But who would step up and liberate the gold from the rainbow warrior? Out came the last person I expected. Zeb Colter on a scooter. He began spouting some nonsense about unity and some what, I figured he was off his meds and escaped the old folks home, but then he introduced the LAST person I expected him too throw his support behind, Alberto Del Rio! The match itself was pretty even as both men were equally matched as they tried to best the other. Mexico’s greatest export wore down the leader of the Cenation with a variety of holds and a high risk offense. Cena would fire back with shoulder tackles, the five knuckle shuffle and the Attitude Adjustment, but all his best moves failed against the returning Del Rio. Alberto nailed Cena with a brutal back stabber then finished him with a kick to the face to pick up the pin fall victory and liberate the WWE Universe of the bully that in known as John Cena. So at first I was excited that Del Rio was back. I was a bit confused and it was a bit ironic that he allied himself with Zeb Colter of all people but weirder things have happened in the WWE. But as the match progressed, I got bored. it just did not hold my interest the way I thought it would. The pace was slow and built to moderate pace that it stayed at slowly. The victory (while extremely welcomed) seemed a bit off. As matches go, I’ve seen better. And I got over my excitement of seeing Alberto Del Rio really quickly, but hey at least I don’t have to suffer through seeing Cena strut around with gold any more. Now I just gotta suffer through the inevitable rematch. This match was one of the most highly anticipated of the night. For months Bray Wyatt has tormented Roman and thwarted every chance at success ensuring that the Big Dog would focus all his attention on the leader of the Wyatt family. For months, Wyatt has taunted and attempted to tear down Reigns by attacking his family, his friends, his psyche in his pursuit to destroy to the powerhouse. It all came to a pinnacle of chaotic destruction as the two forces of nature were locked in the Cell to see who was the dominant power to be reckoned with. For Bray, it was about destroying another hero to the WWE Universe and exposing Roman as the fraud he believed him to be. For Roman, it was about honor and ridding the WWE Universe of a dark and evil force. Or it could really have been a fight between two guys that just on’t like each other, but I enjoy a flair for the dramatic. Reigns came at Wyatt hot and heavy with right hands that had kept him on the defensive, but the New Face of Fear answered back with his own offense. the two tore into one another, both struggling to maintain the offensive momentum that would ensure victory. But when one seemed to have the upper hand, the other would turn it around. The brutal clash of titans included kendo sticks being destroyed over each man, Bray Wyatt being speared and powerbombed through tables, Roman was spiked from the ring apron into the unforgiving wood, and he even kicked out of a Sister Abigail. Roman however did what I didn’t think him capable of doing. He was able to beat Bray and not have to go to the Dark place I expected him to have to go. Roman showed his resilience and perseverance as he was able to conquer the Eater of Worlds with the most devestating Spear he had taken to date. It was over just a 3 count later. Ever since the New Day regained their tag team championships, the Dudley Boys have been stalking them. Bubba Ray and D-Von even went so far as to put poor Xavier woods Out of commission and rob the WWE Universe of his musical talent and magical ability to spread the rainbow of positivity. But at Hell in a Cell, the two teams collided in a bout for the WWE Tag Team Titles. It was a treat to see a bit of homage paid to the late great Eddie Guerrero, as Kofi attempted to make the referee think that he had been hit by the trombone. The ref however did not disqualify the Half brothers as he did not see the blow. 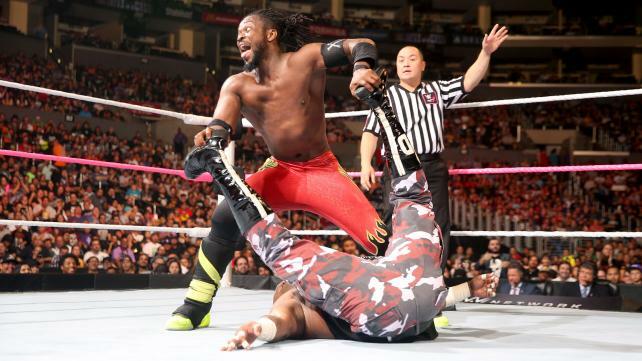 The match continued to pick up the pace and build to a fever pitch as the Dudleys set Kofi up for the 3D. But Big E was able to use the pieces of the Trombone and hit Bubba with it hard enough to stun him and allow Kofi to nail the Dudleyville resident with a Trouble in Paradise and retain their Championships. This match was easily one of the best matches of the evening. Both women came to the ring minus their teams and battled it out woman to woman. Nikki concentrated her offense on Charlotte’s back and legs, with the plan of taking away the Champion’s ability to lock in her greatest weapon, the Figure 8. But Charlotte is no one trick pony as she answered each blow dealt with one of her own. The genetically superior Diva hit Nikki with a spear that rivaled Roman’s and locked in the figure four onto the Challenger. Nikki tapped and Charlotte retained. This is the match I most wanted to see. Our beloved WWE World Heavy Weight Champion went to battle a demon who has been terrorizing the WWE Universe in the form of Corporate Kane for far too long. Kane’s reign of tyranny would soon be put to an end as the Savior of the WWE turned into a Demon Slayer. The Champion was undeterred as he stood toe to toe with his fiery foe. Kane must not have appreciated being called out in front of the WWE Universe for he answered with a thunderous right hand that sent Rollins reeling. But our Champion would not let such thing keep him down as he began to run circles around the 7ft relic from the Attitude Era. Rollins withstood everything dealt to him including a flying clothes line, and a massive choke slam that threatened to end it all. But Seth, is the Architect and used not only his athleticism but his intelligence to slay the demon as he out witted the monster and powerbombed him through the Spanish Announce table! Rollins too paid homage to Eddie as he hit a frog splash on the washed up has been that Kane is. It was not enough to put the monster down but it did wear him down enough that Seth continued his attack with the devestating move of his mentor, the Game, HHH. A pedigree put down the Demon and Rollins retained his gold and once again became the Savior of the WWE and Demon Slayer! It is always good to see Seth Rollins in a match. It is always good to see him win. But what makes this victory even sweeter is it shuts up the people who claim Seth can’t win a match with out help. Guess what buddies, Seth beat the Big Red Machine on his own no help. Kane is just another in a long line of challengers who just simply do not measure up to the greatness that is the MAN, Seth Rollins! Not even gonna pretend on this one. I was so disappointed in this match. It had the potential to be something good, but for what ever reason it lacked the fire and passion of their previous battle for the title. Sure Ryback came out and dominated Kevin, and Kevin fought back, and ended up hitting Ryback with a pop up powerbomb to win, but this match did NOT hold my interest. It was more of a oh look Ryback is hitting Kevin, this does not look good for our champion. Nice, KO is building momentum, pop up powerbomb! oh… it’s really over.. So he got beat up and hit a pop up powerbomb for the win.. that’s it? I was expecting more. I didn’t get it and life goes on. This was a match that everyone in the WWE universe has been waiting on. A rivalry over a decade old, tainted victories and broken streaks, all of it came to a head in a Hell In a Cell match that was straight out of a different era. The war that took place in the cell between Lesnar and the Deadman reminded everyone why these matches are to be feared. Lesnar had one goal, take the Undertaker to Suplex city and don’t look back. Taker’s goal was to avoid that trip at all cost and prove that he was still king of his yard. The Phenom fought like a man possessed as he began to brutalize Brock and get him on the defensive quickly. Taker soon took a page out of Reigns’ book and introduced Lesnar’s face to the ring post. The result was much the same as the Conqueror was busted open early in the bout. The sight of his own blood seemed to infuriate the Beast as he kicked it up into a different gear and took the fight back to the Deadman and brutalized him with a steel chair. The Undertaker ended up busted open as well but would not stay down. The two fought all over the cell and used the cage of the structure as a weapon for their own sinister plans. Finally Brock was able to land his beloved suplex and the fire in Taker seemed to fade for the first time in the night. After another he was dazed, and then the F-5s began. he kicked out of the pin attempt. Brock delivered another, Another Kick out. Frustrated, Lesnar began to dismantle the ring to expose the naked wood. But in a last gasp Taker rose and captured Brock to deliver a tombstone pile driver! But the Beast would not die. He rose up and used a move straight out of the Deadman’s play book from Summerslam. The low blow was enough when followed by yet another brutal F-5 on the exposed wood, that The Undertaker was defeated yet again by Brock Lesnar!! The night was not yet over for the Deadman. With the conquering Lesnar in the back, Taker rose from the ring and basked in the well deserved respect of the WWE Universe. Just then the lights went out and out came the unified Wyatt Family. They surrounded the ring and then at the order of the New face of fear, pounced on the weakened Deadman. They delivered a brutal beat down that left the Undertaker limp and the Luke Harper, Braun Strowman and Erick Rowan carried the lifeless body of the Undertaker as they followed behind their leader Bray Wyatt to end the show. 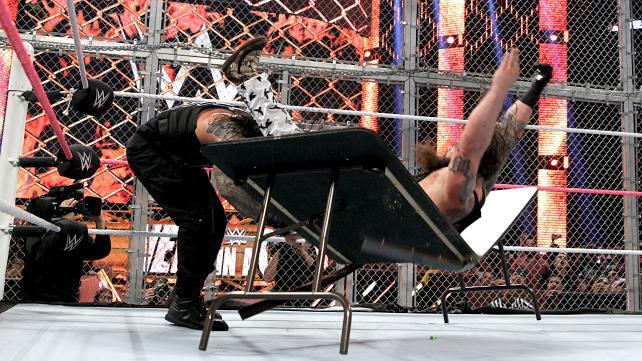 This match was a throw back to a different time when the brutality of the Cell was something to be dreaded. These matches used to be the most vicious uncomfortable things to watch. This match lived up to the hype and surpassed. The surprise at the end was most welcomed. Sure hate on me all you want, but Bray Wyatt is a player in the dark forces. And while he by himself was not able to take the Undertaker’s power at Mania, he waited patiently for a time to strike. And strike he did and now he can use what he knows to add that darkness of the Dead man to his own and watch his power grow. The WWE Universe needs to be very afraid. This entry was posted on Monday, October 26th, 2015 at 10:45 pm	and is filed under Events, News, Television. You can follow any responses to this entry through the RSS 2.0 feed. You can skip to the end and leave a response. Pinging is currently not allowed. « Wizard World Comicon Lands in Tulsa, OK!!! I'm gonna tell you something. Somebody messes with me, I'm gonna mess with with him. Somebody steals from me, I'm gonna say you stole. Not talk to him for spitting on the sidewalk. Understand? Now, I have done nothing to harm these people but they are angered with me, so what do they do, doctor up some income tax, for which they have no case. To speak to me like me, no, to harass a peaceful man. I pray to god if I ever had a grievance I'd have a little more self respect. One more thing, you have an all out prize fight, you wait until the fight is over, one guy is left standing. And that's how you know who won.